Next week “The Striped Album” will be released in Spain through Rock Indiana Records. It can be pre-ordered now through their website. “The Striped Album” will be released by Thistime Records in Japan on 2 Feb, including four bonus tracks – Earnest Endeavor, Time Is Slight, Somehow Everything (Posies cover) and The Genuine Fakes (8 bit version). Click here to order! Here’s the music video for out new single “I Don’t Want It”. 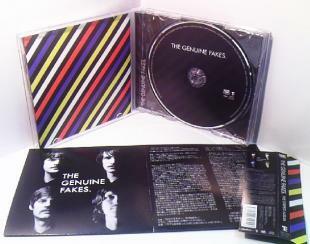 The song will be available for download at http://music.thegenuinefakes.com on Friday! The album’s mixed and done! Now we’re sending it off to the mastering-guru to give it that magic finishing touch. A May release is what we’re aiming for. Prior to the album release we’re going to put out a single. More news on that soon. We would also like to extend our thoughts out to Alex Chilton of Big Star fame who has just passed away in an apparent heart attack at age 59. He made such a huge impact on music history. We wouldn’t be here fakin’ it had he not inspired bands like The Posies to make such great music. Joey previously blogged about Big Star’s #1 Record as a part of his “Essential Powerpop Albums” list. You can read that post here.